i am a big fan of shoes. let’s pretend that i’m not weirdly a 9 1/2 that straddles the line between a nine and ten, that my feet aren’t wide, and that finding shoes on zara’s website is easy. the struggles (but they aren’t truly struggles, just be being dramatic). anyhow, j.crew is killing the shoe game at the moment. every shoe pictured above can be found on their website, and they happen to have 30% off sale and 25% off of regular price items… so if you happen to be waiting to make a purchase, now is your time. the slippers by stubbs & wootton are WAY out of my price range, but a girl can dream. 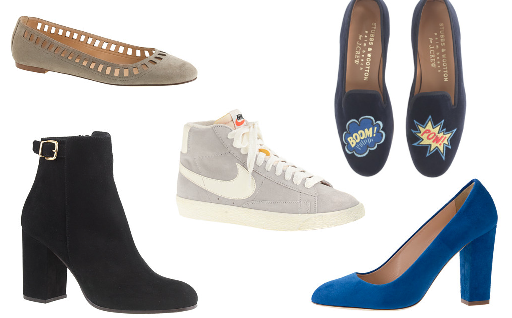 on the other hand, the nike blazers, the stella pumps and the lattice suede ballet flats are all on sale… a.k.a. they are one hell of a temptation, but i will resist. if there is any chance the barrett booties go on sale though, there will be no stopping me. They actually are really comfortable! Plus, they’re on sale for such a good price.